Close inspection of this leaflet reveals it to be an early example of photographic editing. The head of the man second from the right is considerably out of proportion to his body. It seems likely that this head-shot was part of a separate photograph, and was superimposed at a later date on to the group photo. Perhaps this man was ill the day the photograph was taken, or replaced another band member. 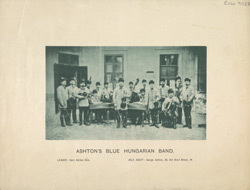 The Blue Hungarian band were a popular draw in Britain over almost five decades. A collection of emigrés from the Austro-Hungarian empire, they were led for the most part by Wilhelm Morgann, and were alternately known as the White Hungarian Band or Morgann's Viennese band. With the onset of the First World War, the band discarded the Hussar uniforms pictured here out of political sensitivity, reverting to dinner jackets and bow ties. They continued playing concerts in Britain until well into the 1930s.